Pop-Tarts is the brand for a flat, rectangular, pre-baked toaster pastry made by the Kellogg Company. Pop-Tarts have a sugary filling sealed inside two layers of rectangular, thin pastry crust. Most varieties are frosted. They can be eaten without being warmed, but are often warmed inside a toaster. They are usually sold in pairs inside foil packages, and do not require refrigeration. Popular flavors include chocolate, blueberry, frosted strawberry, frosted brown sugar cinnamon, cherry, and S'mores. 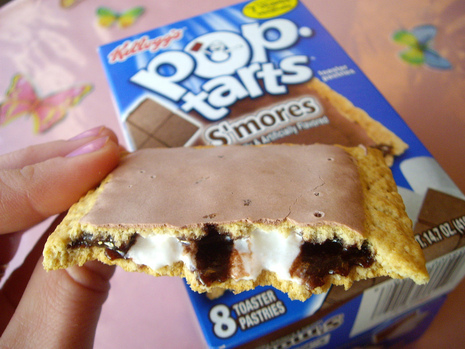 Pop-Tarts are Kellogg's most popular brand to date in the United States, with more than two billion Pop-Tarts sold each year. They are distributed mainly in the United States, but also in Canada. They can also be found in the United Kingdom and Ireland. 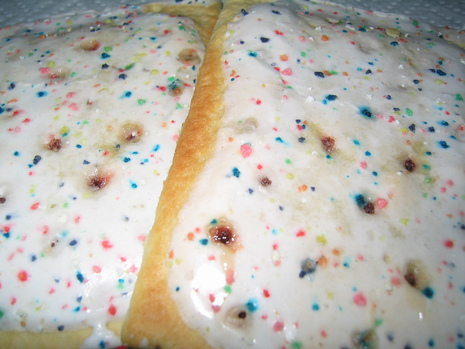 Pop-Tarts were discontinued in Australia in 2005. Post Cereals first created the confection that would become Pop-Tarts in the early 1960s. Post adapted its process for enclosing food in foil to keep it fresh without spoiling—first used for dog food—to its new toaster-prepared breakfast food. Intended to complement its cold cereals, Post announced its new product in 1963 to the press, giving them the name "Country Squares". Because Post had revealed Country Squares before it was ready, Post's biggest competitor, Kellogg, was able to develop its own version in six months. Kellogg's rushed their new pastry into the market very quickly and its name came from one of the hottest things at the time: Pop Art which Andy Warhol made a household name with his giant soup cans and Brillo boxes. 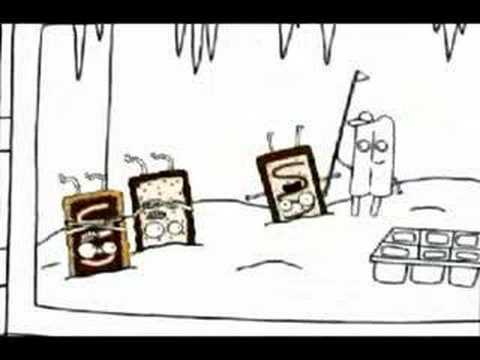 Pop-Tarts advertised its new product by an animated toaster named Milton and could not keep the shelves stocked because it became so popular. Originally not frosted when first introduced, it was later proved that frosting could survive the toaster, and the first frosted Pop-Tarts were officially released in 1967. The first Pop-Tarts came out in four different flavors: strawberry, blueberry, brown sugar cinnamon, and apple currant. Today, there are a wide variety of Pop-tart flavors, including Chocolate Chip, S'Mores, Raspberry, French Toast and Mint Chocolate Chip. In 1992, Thomas Nangle sued Kellogg for damages after his Pop-Tart got stuck and caught fire in his toaster. The case gained wider notoriety when humor columnist Dave Barry wrote a column about starting a fire in his own toaster with Pop-Tarts. In 1994, Texas A&M University professor Joseph Delgado performed an experiment showing that, when left in the toaster too long, strawberry Pop-Tarts could produce flames over a foot high. The discovery triggered a flurry of lawsuits. Since then, Pop-Tarts carry the warning: "Due to possible risk of fire, never leave your toasting appliance or microwave unattended." Pop-Tarts were introduced with fairly substantial marketing to the United Kingdom in the early 1990s, although they have failed to replicate their U.S. success and the only available flavours are now chocolate and strawberry. In 2001, the United States' military dropped 2.4 million Pop-Tarts in Afghanistan during the United States War in Afghanistan. In 2004, Pop-Tarts began a new ad campaign titled "Crazy Good". Characters that appeared often were a singing lizard and a group of kids, dubbed "crazy-good kids", who commonly frightened the Pop-Tarts and caused them to be eaten or chased away. The ads employ squiggly animation, surreal humor, and non sequitur, all of which bear a strong resemblance to the signature work of animator Don Hertzfeldt. One "crazy-good kid" in particular bears strong resemblance to Billy in Hertzfeldt's Billy's Balloon. However, Hertzfeldt was not involved in any way with the ads and in 2006 was considering possible litigation for stealing his work. 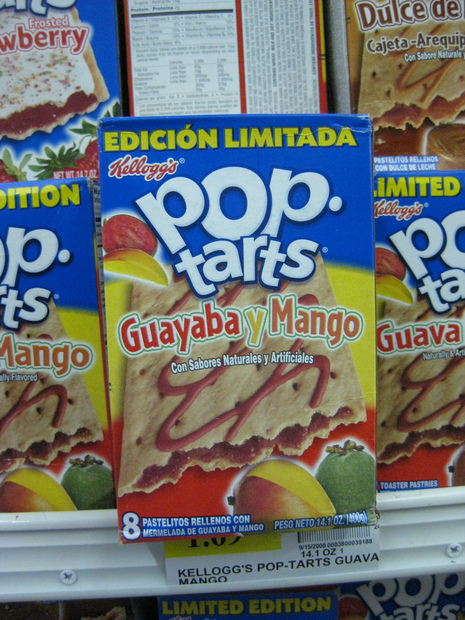 In 2006, Pop-Tarts also introduced a version of the product known as Go-Tarts. These were similar to Pop-Tarts, but were thicker, narrow, and wrapped individually (instead of in packages of two). Go-Tarts were discontinued in 2008. Industry trade groups have raised issues with Pop Tarts advertising. Efforts to capitalize on consumer demand for healthier foods has led to the on and off label promotion of products that contain relatively small amounts of fruits and vegetables and/or contain them as part of a product with unhealthy amounts of fat, sodium, or refined carbohydrates. These products, such as fruit drinks, Pop Tarts, and highly sugared cereals, are more often energy dense than nutrient dense. FDA, working with the FTC, should strengthen its guidelines to prevent the promotion of products based on their fruit and vegetable content unless these products maintain the integrity of fruits and vegetables as healthy foods, and make a reasonable contribution to the recommended daily intake for fruits and vegetables. In 2006, the Children’s Advertising Review Unit (CARU) of the Council of Better Business Bureaus, prompted by a customer complaint, "recommended that Kellogg modify packaging, eliminate the phrase 'made with real fruit'." 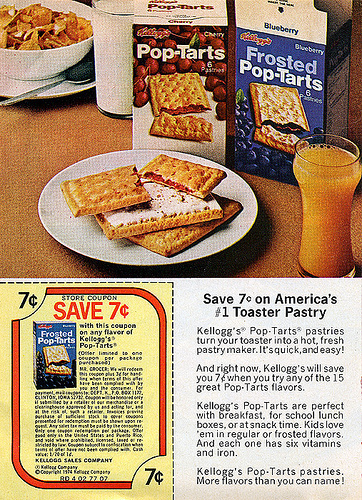 Kellogg agreed to do so, and redesigned packages for the Pop Tarts line accordingly; they assured CARU that the "claim does not appear on television or print advertising" and offered to "participate in CARU's self-regulatory process" and "take CARU's focus areas into consideration" as Kellogg proceeds with its "future child-directed advertising." Cable in the Classroom has used a Pop Tarts television commercial as an example in their media literacy program for children. They ask adults to watch a Pop Tarts commercial with their children or students and "have them look at how much product information is presented and how much is really about lifestyle or attitude." I think we should call this "Bring me the head of the head of marketing!" Either way, I'm still surprised by the number of sites on the Internet that have no real value but still exist. (I should probably point out that I'm not referring to the millions of sites that have been created by individuals for their own quirkiness or satisfaction. I'm a believer in free speech, and if you want to spend your time creating a Web site devoted to the plight of the three-toed sloth, knock yourself out!) 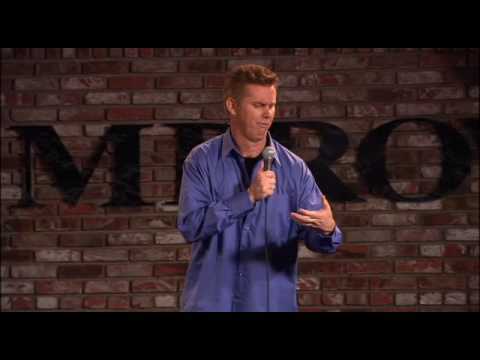 I'm talking about are all the sites that have been built by professional, creative people for money -- mainly other people's money.